Last month Dana and I headed up to Homewood, AL, to do an in-home style consultation for one of our sweet clients. Our client had already received one of our E-Designs for her living room and was well on her way to putting all of the pieces together. But one thing in the room kept stumping her--the bookshelves. She had not one, but three built-in bookcases in her living room--I know, we're all a little jealous. She also had a great assortment of accessories, collectables and frames to help fill them. The problem came when figuring out where to place everything. 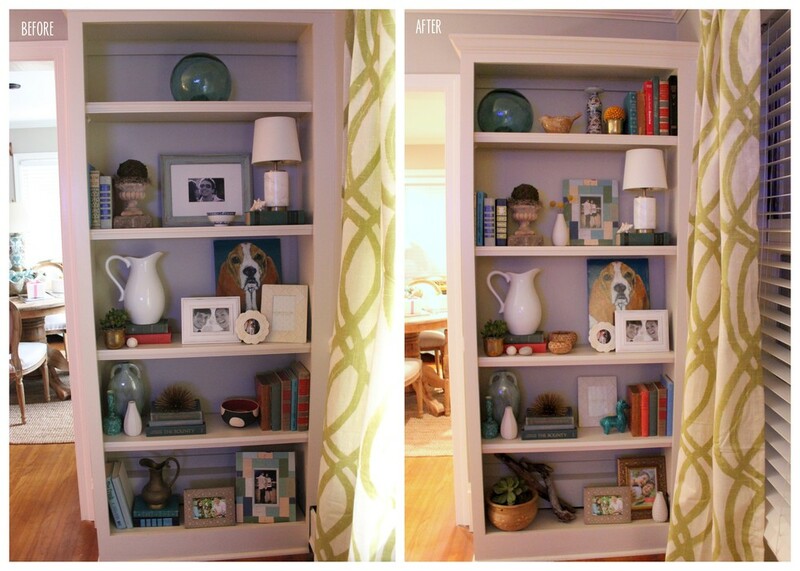 Styling bookshelves is definitely an art. Even the most keen eye will move pieces around several times before stepping back and looking to see if it is just the way they want it. This was something the homeowner had done several times but had yet to figure out the puzzle. She needed our help, and we were thrilled to give it. She did a great job with two of the built-ins but wasn't fully satisfied with the outcome...and she didn't even know where to begin on the third one--the deepest one of the them all. We honestly have to say that she did a really great job. Two of the bookshelves were almost "complete," but they still had a few little problem areas. A few of the shelves were still empty or didn't showcase the pieces like she wanted, there was little red (a color that needed to be added to balance out the rest of the room) and all of the remaining accessories weren't right for the third, incomplete shelves. We began by tackling the most difficult bookcase first, the deep one next to the fireplace. Once we got things looking good in there, we knew we would be golden with the other two. We spread out the red accessories among all of the shelves so that one side of the room wasn't weighted in turquoise and showcased her prized possessions were they could all be seen. A couple of hours (and a lot of chatting--we seriously have the best clients) later, we were done. Here are a few before and after shots (please excuse the lighting--it was dark by the time we finished). Bookcase one with the deepest shelves. Bookcase two. The fish floats are a favorite of the clients so we moved them to eye level on the deep shelf for everyone to see. What do you think? Just a little rearranging can go a long way, huh? We loved the final outcome and so did our client. After leaving she sent us a text saying "I can't stop looking at them. Thank you! Thank you!" I'd say that was a success! We love what we do--especially when doing our job makes you love your home even more. Contact us today and let us know how we can help you---no project is too big or too small! In closing, I have to say that last bookcase is my favorite. Which one is your favorite--1, 2 or 3?